Look at the pattern what is missing. Drag the missing thing on its place. 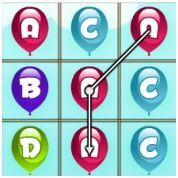 Just check how many patterns you can complete in 3 minutes.This is an Ad Free Game.